I’ve ordered 50 Bare Root plants of the Liriope spicata ‘Silver Dragon’ for use in S1 from Classy Groundcovers. Total cost: $86. Hope to have them here by next week. A large box of plants awaited me when I arrived from work last night. I eagerly unpacked my Sooner order to check the condition of my plants. Next to my Lazy S’S order last year, this was one of the best packaging jobs I had seen. Sooner gets an A+ for some custom packing; nothing could have shifted or slid around in the carton during shipment. Judging from the condition of the plants, everything seemed to have survived their trip in excellent condition. (Good notification process by Sooner as well, I had ship notices in my email earlier in the week.) Just as a recap, I had 6 3.5in pots of Ajuga, 1 3qt Heuchera Obsidian, 1 3qt Hosta Fire & Ice, and 2 3qt Artemisia Limelight. Of all the new arrivals, only the Hosta had no foliage, presumably because it is dormant. I’m looking forward to planting the so-called thuggish Artemisia Oriental Limelight. A review of its characteristics at Dave’s Garden reveals that this plant will grow up to 4-6ft. Many of the comments remarked on its invasive nature. Frankly, I’m curious to see how it fares in the inhospitable rear beds especially during the dry summer months. I will plan to put a specimen each in B2 and B4 and keep tabs on them throughout the year. At its supposed height, I just need to remember to plant it in or near the back. It’s herbaceous though, so no evergreen colors during winter…a shame since it’s such a variegated beauty. …that crazy cardinal comes knocking at your windows. This silly bird has been tap-tap-tapping at our windows almost every morning for the past 2 years (usually during the spring/summer). He’s back for an encore in 2008. More info about this bird species at the Wikipedia. 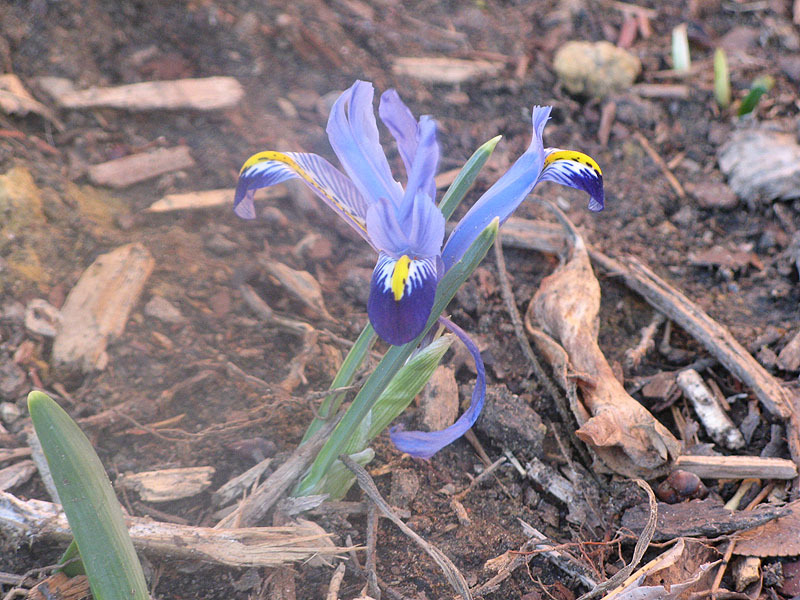 I caught sight of a pair of dwarf irises (iris reticulata) blooming in B3 yesterday. I snapped this picture this morning; not sure if it’s Cantab or Harmony. It looks like the rain we received Monday night (or was that Tuesday) gave these irises enough incentive to put on a show. 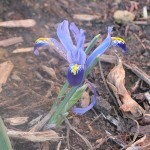 I’m hoping to see more irises pop up in both S1 and B3 in the next few days. Also, as I was doing some yard clean up yesterday, I spied what looked to be either a tulip leaf or a calla leaf in S1…can’t wait to see what it is. Now why can’t I follow that advice? I swung by Home Depot after lunch today to purchase some gardening gloves, and walked out with 2 packets of Burpee seeds: Dianthus deltoids Microchip Mix and Centaurea cyanus Blue Boy Bachelor Buttons. I opened the seed packets to see the likelihood of sowing these seeds for spring…as usual, I can’t see how dianthus seeds successfully sprout given their near-microscopic size. The bachelor buttons look more likely to produce some results; I’m looking forward to adding them to S1 and B3, along with Miss Jekyll Blue nigella damascena. In addition, I rediscovered a seed packet I received from Wildseed Farms last year. Bluebonnet, coreopsis, Indian Blanket, Black-Eye Susan, Lemon Mint, Drummond Phlox, Cornflower, and Corn Poppy are listed. I’m debating the placement of these seeds; I’m uncertain that I want to introduce these into the beds but it may give the flower beds a burst of color for spring, until the lilies and flowering perennials can come into their own.